Fluid Cooling System is required for Absorption of Heat from Heat Transferring Fluids and exhausting same in Atmosphere. Fluids used for Heat Transfer can be Water, DM Water, RO Water, Coolents, Glycol, Oil or any other Liquids that can carry Heat while Flowing. Atmosphere can be open Air, Earth, River, Sea or any thing with indefinite Heat Absorption Potential. Snowcool India Designs and Manufactures widest Range of Fluid Cooling Systems for variety of Applications. Briefly, Fluid Cooling Systems are of Two Types, First is Open-Loop Fluid Cooling Systems and Second is Closed-Loop Fluid Cooling Systems. Open Systems are limited to Water Cooling and are termed as Evaporative Cooling Systems, commonly called as Evaporative Cooling Towers. Closed Loop Fluid and Water Cooling Systems with Convective Cooling via Fan Coolers. This uses Fresh Atmospheric Air as Convective Fluid Cooling. Closed Loop Fluid and Water Cooling Systems with Convective as well as Evaporative Cooling via Fan Coolers and Water Sprays. This uses Fresh Air for Convective Cooling and part of Water as Sprays for Evaporative Cooling. Sea Water Cooled Closed Loop Fluid and Water Cooling Systems. This uses Sea Water for continuous Fluid Cooling. 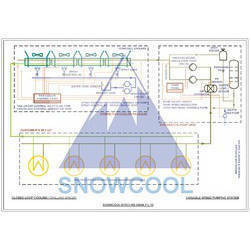 Snowcool India designs and Manufactures all type of Closed Loop Fluid Cooling Systems for all type of Applications. Snowcool Systems India Pvt Ltd. manufactures Closed Lood Cooling and Circulation Skid, that can be used for Cooling the Processess in Pharma, Packaging, Electronics, Defence and R & D Sectors.The Integrated Pump Skids are best Energy Conservative and Accurate Solution for Critical Cooling Applications. Pressure Tanks are used for Pre-Pressurised Loop, that eliminates requirement of Surge / Storage Tank. Hot Redudant PLCs, Touch Screen HMI and VFDs are used, which provides 100% Reliability. This is matchless innovation. We are offering Process Coolant Cooling Circulation System. Several Processes requires very accurate Cooling via High Resistivity DM or DI Water, and with High Filtration. Example Microwave Devise Testing, EPMA Testing Machines, MRI Machines, Atomic Testing Devices and Many More. 100s of Customers across the Globe are using this Systems for Defence and R & D Applications. We manufacture Sea Water Cooled Cooling Systems for Coastal Industries and Plants. Being Sea Water has unlimited potential for Cooling any production Process or Plant Utilities, the same can be used effectively by its Circulation. We Manufacture the Sea-Water Pumping Stations or Skids for Intake and Circulation of Sea-Water. 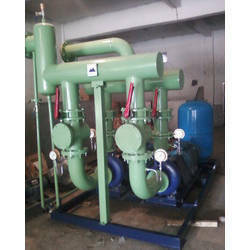 This Pumps will Lift Cold-Sea-Water from Sea and Drop Warm-Sea-Water into Sea. This Cooling Systems are Integrated Pump Skids fitted with Sea-Water Compatible PHEs, Pump-Sets, Pressure Vessels, Shot-Feeders, Air-Separators, Headers, Fully Automatic Control Panels etc. We always ensure Sea Water Resistant Materials like Titanium, Monet-Metal etc for Sea Water Circuits. Our Cooling Systems are Factory Manufactured Fully Integrated Skids and are ready to use on Customers Project Sites. This Systems are very Popular in Coastal Areas where Sea Water is available very close and their Fluid Cooling Requirements are huge. Snowcool systems India (p) ltd, Mumbai manufactures ready-to-install Closed Loop Water Cooling Systems, also termed as dry fluid cooling systems or hybrid fluid cooling systems. Cooling fluid can process water, dm water, battery water, coolant, brine, glycol, oil, acid or thermic fluid. Fluid coolers are available from capacities of 1 cmh to 3000 cmh in single and or multi-cell constructions. Our fan fluid coolers are either dry type or hybrid type, as per fluid cooling temp. Fluid coolers are mainly of flat bed design and comprising of ss coil assemblies for long-corrosion free life. Our integrated pump skids are equipped with variable or constant speed pumps, pump starters, vfds, pump controllers, plcs, display units, transducers, sensors, expansion tanks, air separator, shot feeder (chemical pot feeder), heat exchangers, by-pass modulating valves, suction & discharge headers, butterfly valves, suction diffusers, check valves, pressure gauges with siphons, all placed on a common rigid base frame. We use pumps of make likegrundfos, wilo, armstrong, ksb, calpeda, nan fung etc. 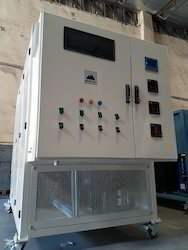 It is programmed to save electric power and optimize pump head & flow as suiting to closed loop system. Variable speed pump ensure constant & balance supply of liquid flow in each of several number of processes or integrated pump skid are useful for chilled water based centralized air conditioning projects, manufacturing and industrial process cooling via chilled water or brine, and large capacity multi-commodity cold storage integrated pump skids are available from 1 cmh to 2000 cmh flow and up to 10 bar pressure. Looking for Fluid Cooling System ?